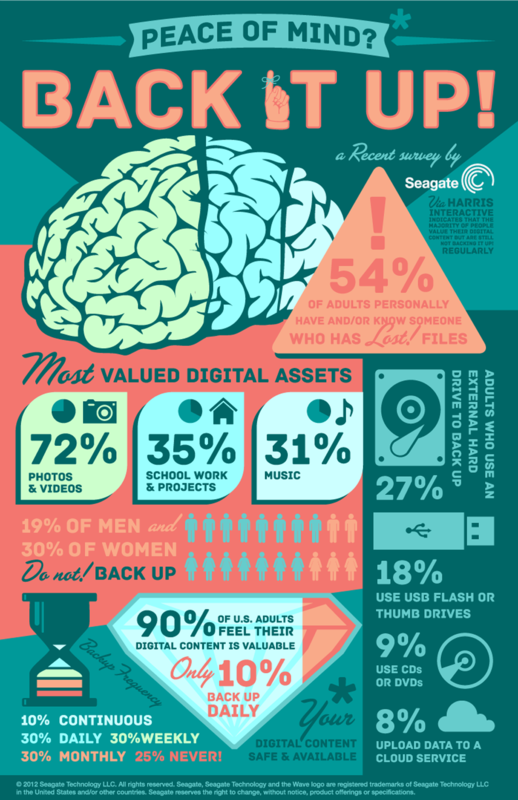 A recent survey by Seagate tells us that 19% of men and 30% of women don’t back up their data. Of these individuals surveyed, a whopping 90% felt their data was valuable but only 10% of people back up these valuable files every day. Further contradictory to logic, most people (54%) know someone who has lost files. Today’s tech options offer countless easy and even free opportunities to back up data. Most people surveyed by Seagate use an external hard drive. Others use USB drives or cloud services. If most people know that backing up their files is important and there are plenty of options to make this happen, why do so few people follow through with backing up on a daily or semi-regular basis? The answer may lie in psychology. To achieve peace of mind and avoid a potential tragedy, allow your mind to trump attempts to procrastinate backing up your data. Your assets are valuable. There are multiple options for backup and daily backup offers the greatest degree of protection.